performing handwork that requires skills and techniques. The skills that they have inherited from previous generations should not be lost and forgotten. We wanted to utilize them in modern life. 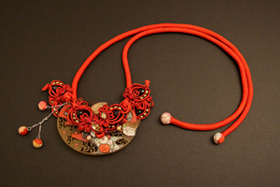 Beautiful old cloths, Chinese buttons, antique combs and other products have been reproduced as custom jewelries. They have been received well not only in Japan but in other countries outside Japan. Copyright© 2014 ATELIER Marika All Rights Reserved.